You can put anything in this. Think of using the same type of items that you would use as toppings on a pizza. 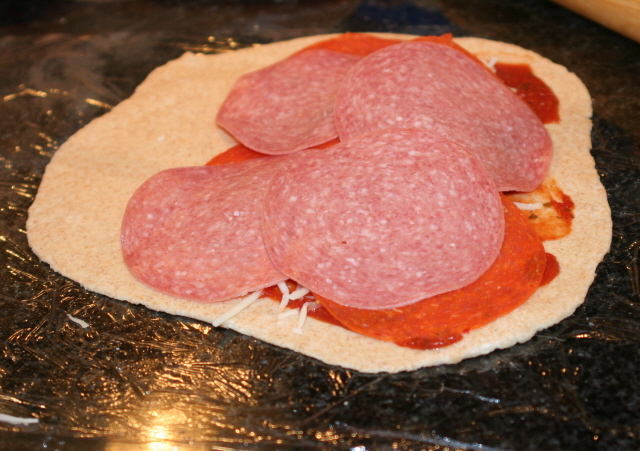 My favorites are salami, pepperoni, and ham. 1. Prepare pizza dough. Cut into four even pieces. Put first piece between two pieces of plastic wrap and roll out until about 1/4 inch thick. 2. Top half of the rolled out dough with 2-3 T of sauce, cheese and your favorite toppings. 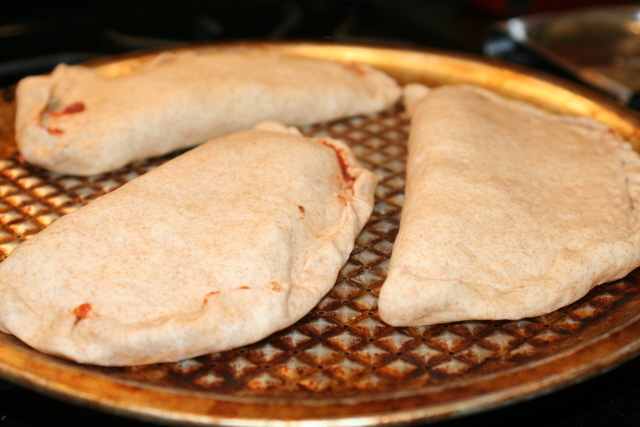 *Tip: Be sure not to fill too full, you need to be able to fold the top piece of dough over to close up all the contents. 3. 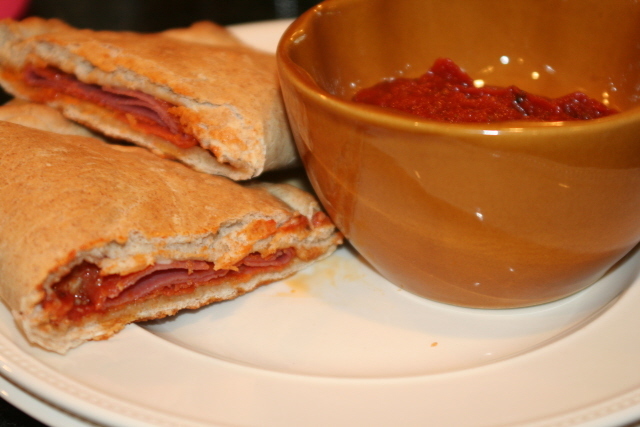 Fold half with no toppings over onto other half and roll up the bottom edges over top edges to seal calzone. 5. Repeat this process with other 3 pieces of dough. 6. Cook for about 15-20 minutes in a 425 degree oven. 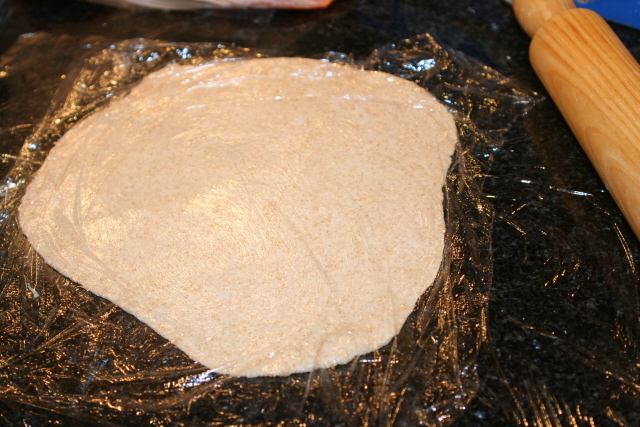 Prepare pizza dough. Cut into four even pieces. Put first piece between two pieces of plastic wrap and roll out until about ¼ inch thick. Top half of the rolled out dough with 2-3 tablespoons of sauce, cheese and your favorite toppings. 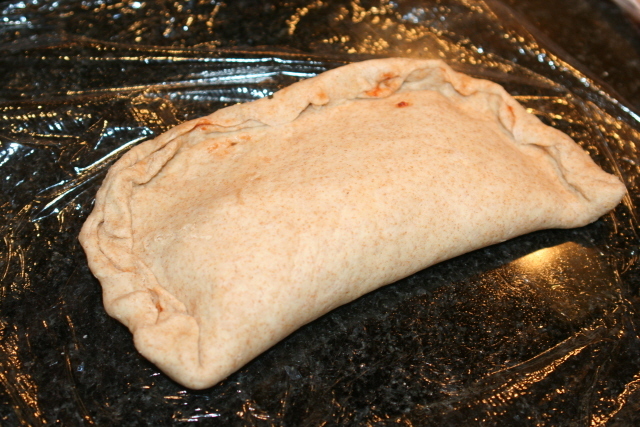 Fold half with no toppings over onto other half and roll up the bottom edges over top edges to seal calzone. Repeat this process with other 3 pieces of dough. Cook for about 15-20 minutes in a 425 degree oven. If you do not thaw a frozen one before you cook what are the cooking recommendations? I didn’t think they would be the same. Also do you freeze on a sheet pan and then place in a freezer container/bag? Thanks, I really love your site. Great to have someone locally who knows what is going on in Middle Tennessee. LOVE IT, we just had these last night for dinner – too funny! Making them this week for food swap. If you want to freeze them, dust with flour, out in wax paper on a cookie sheet in freezer then transfer to a freezer bag. I brush with egg before cooking for a shine! A friend just referred me to your site! I love it! In the last two days Ive managed to make two recipes! Thanks!